This is a truly indulgent cake, made with early English raspberries. You can top it with toasted, desiccated coconut if you don't want the bother of cracking open a fresh coconut. Preheat the oven to 180°C, gas mark 4. Butter two 20cm cake tins and line the bases with discs of buttered baking parchment. Cream together the butter and caster sugar until pale and fluffy. Gradually add the eggs, mixing well between each addition. Bit by bit, and alternating with the coconut milk and lime juice, sift in the plain flour, baking powder and a pinch of salt. Mix until smooth, then stir in the lime zest and desiccated coconut. Divide between the tins, putting slightly more mixture in one. Spread level and bake on the middle shelf for about 30 minutes, until a skewer inserted into the middle of the cakes comes out clean. Cool for 5 minutes, then turn out onto a cooling rack to cool completely. Next, remove the coconut from its husk and shave into strips using a vegetable peeler. Arrange on a parchment-lined baking sheet and toast in the oven for 5 minutes. Beat the Mascarpone with the icing sugar, lime juice and some of the zest. Split the bigger cake in half horizontally, to give 3 layers in total. 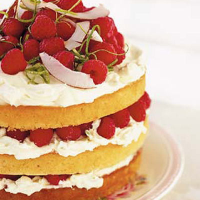 Place one layer on a plate, spread with a third of the Mascarpone mixture and scatter with a third of the raspberries. Top with another layer and repeat. Add the final layer, spread it with the remaining Mascarpone; top with the remaining raspberries, zest and the toasted coconut shavings.